Remember when Twitch Played Pokemon? One channel streamed the Game Boy RPG 24 hours a day and crowdsourced control from its viewers – who flowed in and out in such numbers that it was possible to complete Pokemon Red with essentially random inputs. That dubious achievement done, Twitch started on the sequel. And they never did stop playing Pokemon. 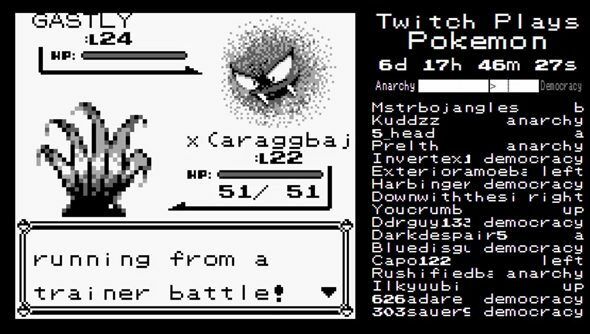 The channel takes commands entered into a Twitch livestream and then feeds them into an emulated version of Pokemon. Rather than taking measures to keep inputs sane and structured, the channel’s operators and fans seem to delight in the inevitable confusion that results from the 20-30 second delay between command and keypress. Just a few days in, a ‘Democracy’ system which decided input based on player votes was implemented. But it was implemented on a continuous sliding scale between ‘Democracy’ and ‘Anarchy’ – in the end giving the TPP community just another thing to bicker about. Six months later, Twitch Plays Pokemon has rattled through nine Pokemon games – most recently including Pokemon X, which can’t be emulated and was therefore played on a 3DS via some sort of stream wizardry. The channel’s current project is Pokemon Stadium 2 for N64. After that it’ll return to Pokemon Red with the goal of finally catching them all, and several options are under consideration for the future. Will it never end? Should it?